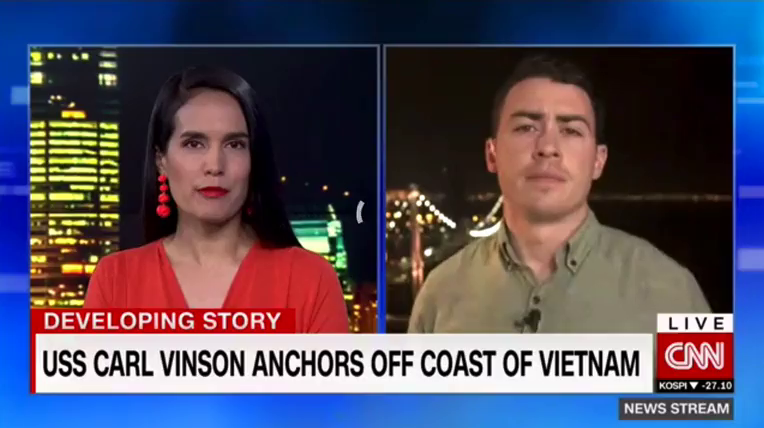 (by Matt Rivers, CNN) Danang, Vietnam — For the first time since the end of the Vietnam War more than four decades ago, a US Navy aircraft carrier has arrived in the country. The USS Carl Vinson anchored two nautical miles off the port city of Danang, which was a key battleground during the war that ended in 1975. 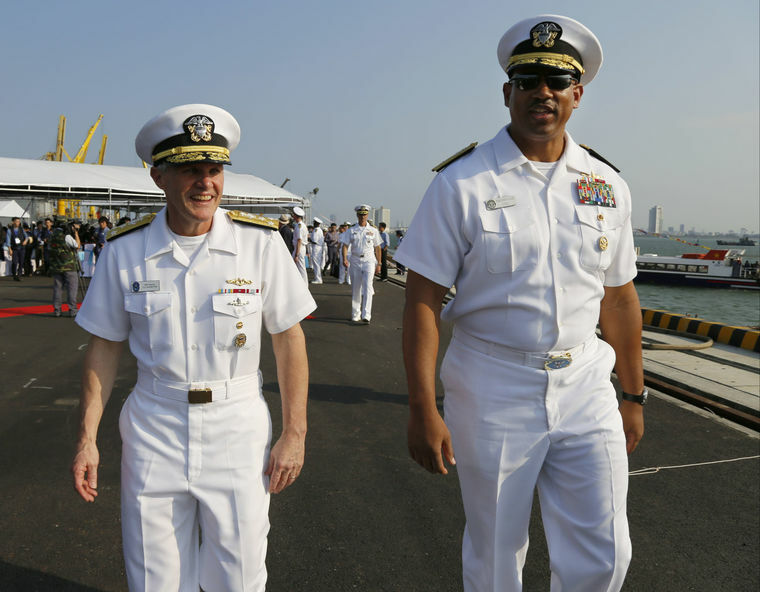 “Our nations’ relationship has reached new heights in the past few years, and the USS Carl Vinson’s port visit to Vietnam is a reflection of that,” said US Pacific Fleet Commander Adm. Scott Swift. But it’s far from a standard port call. Analysts say the visit by the 95,000-ton carrier to Vietnam is a clear shot at Beijing, designed to counter China’s aggressive island building and militarization in the South China Sea. “Vietnam has been deeply concerned about China’s pugilistic and aggressive moves in the South China Sea,” said John Kirby, a retired US Navy rear admiral and CNN military and diplomatic analyst. Cultural exchanges, including culinary and sporting activities, will take place between some of the US military personnel on board and their Vietnamese counterparts. Some US sailors will also visit a center for victims of Agent Orange, the toxic chemical compound used by the US during the conflict to destroy jungles and forests. The subject of China, and Chinese activity in the South China Sea, is likely to loom large over the visit. Since 2014, China has forged ahead with island-building in the disputed waters, despite a landmark ruling in 2016 by the Permanent Court of Arbitration in The Hague, which said there was no legal basis for China’s maritime claims. China’s claims to the South China Sea stretch roughly 1,000 miles from its southern shores, pitting it against Taiwan, the Philippines, Brunei, Malaysia, and Vietnam. High-resolution aerial images of China’s reclamation efforts in the Spratly Islands, recently obtained by the Philippine Inquirer newspaper, show that the reefs and sandbars have been turned into island fortresses, with ports, air strips, lighthouses, hangars and multi-story buildings. Vietnam is among the claimants that has stood up most publicly against China, after the Philippines — long one of most ardent critics of Chinese expansion in the area — reversed course under President Rodrigo Duterte. ….. The United States has long had a robust naval presence in Southeast Asia, in part to ensure the openness of the South China Sea trading routes. Some $5 trillion in goods pass through those waters each year. 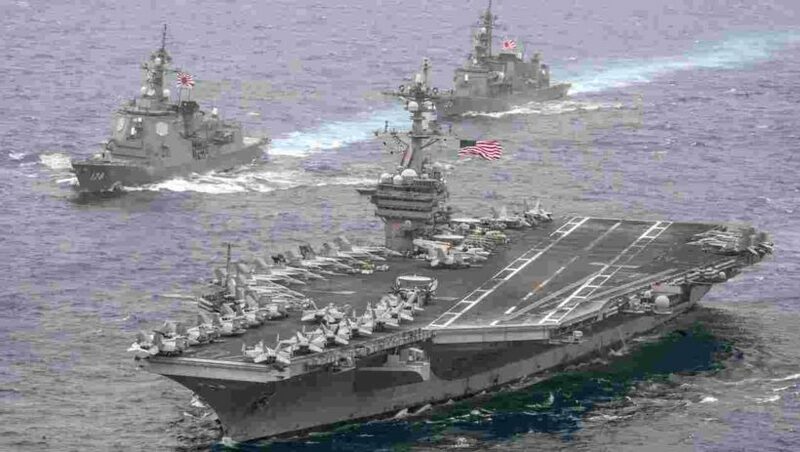 Under US President Donald Trump and his predecessor, President Barack Obama, the US has conducted “freedom of navigation” operations, sailing military vessels and flying planes close to islands China controls, often triggering heated warnings from Chinese patrols. But it has done little to rein in China’s expansionism in the South China Sea. “The US does need to take a consistent and perhaps more assertive approach to how to deal with this advancement,” said Admiral Kirby. This article published at CNN on March 5.
b) What is the U.S.’s public reason for deploying the nuclear powered aircraft carrier USS Carl Vinson (and two other naval ships) to Vietnam? c) What is the more important reason for the visit? In June 2017, Vietnam refused Chinese demands to cease drilling on Vanguard Bank, an area that belongs to Vietnam under international law. Vietnam had granted a subsidiary of Spanish company Repsol drilling rights to the bank. China claims the area is part of its territory. Vietnam eventually backed down a month later, under pressure from China. Vietnam has also urged its fellow ASEAN nations to take a stronger stance against China in the South China Sea, though the body has largely chosen not to forcefully challenge Beijing. 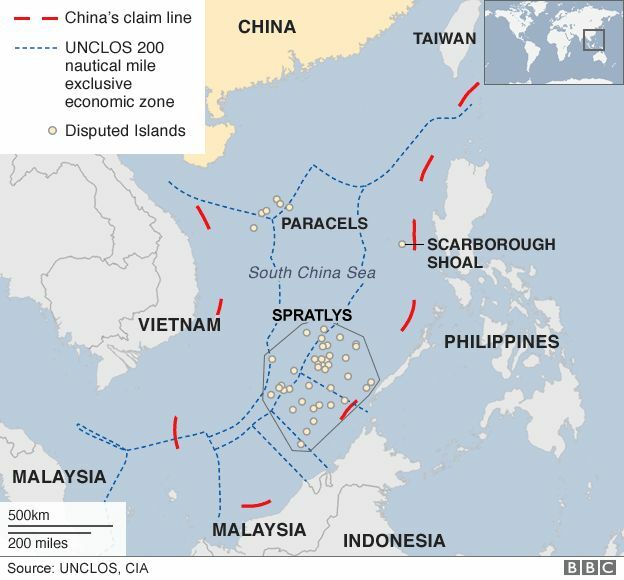 The United States hasn’t taken any official position on South China Sea territorial claims but conducts “freedom of navigation” operations in the waterways by sailing ships without notice through disputed areas. China has condemned the operations and has responded in the past by scrambling fighter jets to monitor the U.S. vessels. 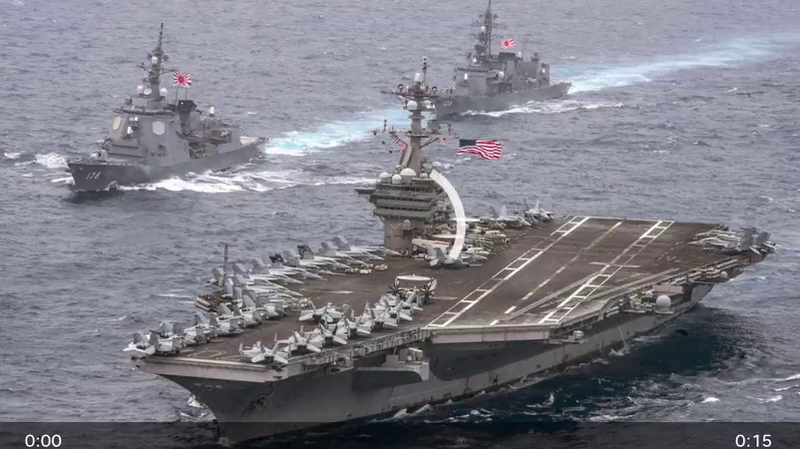 “The message the USS Carl Vinson sends is that the U.S. will maintain its naval presence in the South China Sea and that Vietnam supports the presence of the U.S. Navy as long as it contributes to regional peace and stability,” he wrote. China claims sovereignty over almost all of the South China Sea, where more than $5 trillion of goods are shipped each year through some of the world’s busiest waterways. Vietnam has overlapping claims on some islands in the sea’s Spratly and Paracel chains, and tensions have flared between the two neighbors over these disputes. In 2014, Beijing deployed an oil rig in disputed waters near Vietnam, which led to a standoff between naval vessels and sparked violent anti-China demonstrations in Vietnam. Historical animosity toward China runs deep in Vietnam, which was occupied by its much larger neighbor for much of the first millennium AD. However, China remains Vietnam’s largest trading partner, and its rising role as the dominant superpower in the region requires a careful balancing act for Vietnam.